Wyatt is 7 years old and was diagnosed with celiac disease when he was 2 1/2 years old. Wyatt was very small for his age and did not gain much weight. He had a distended belly, very small arms and legs. He also would randomly vomit or have diarrhea. There is no one in our immediate family that have been diagnosed. My husband, older son and myself were tested shortly after Wyatt's diagnosis and the test came back negative. I keep an eye on my older son as Celiac can lay dormant and pop up at any time. 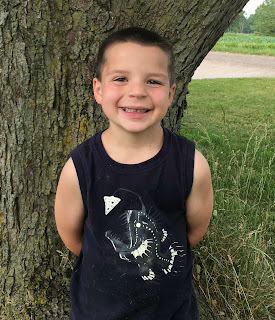 Luckily, Wyatt was so young when he was diagnosed that he does not remember life without Celiac. Preschool and Kindergarten have been a little more challenging with food, snacks, parties, etc. as I want him to have as normal a school experience as possible and feel like the other kids. I am so grateful that our school is open and willing to help me make that happen. Having a child newly diagnosed is hard. It does get easier with time. Be vigilant in reading labels, companies change ingredients in products all the time. Don't be afraid to be the Mama Bear to protect your kids and teach your kids to ask questions about what a product is made of. It makes things much easier for them when they head off to school. Look at you Wyatt, you're getting so big and strong! You remind me a lot of Jack, as he was diagnosed at 2 years old with the same symptoms as you. And yes, reading labels is so very important! As well as teaching our kiddos to ask questions and being vocal about their gluten-free lifestyles.